In the days before a major holiday, movie news dries up completely. (Unless it's something that's actually genuinely important, like that fact we're gonna have to wait until next year for The Rock and Bruce Willis to be in a movie together.) But before Memorial Day, studios start unveiling a ton of new trailers, which is perfect way to kill time for all us miserable slobs tied to our desks waiting for our vacations to start. Evaluating trailers is a fool's errand: They don't tell you anything about how the movie's really going to be. But it's fun to guess. So with that in mind, here are five new trailers that have come our way in the last few days. And to make it easier, I'm going to use the old Trailer Hitch format from Will's and my days at The Projector. Warning: There will be some math involved. Trailer category: House of the Ominous Bad-Assery. Major selling points: Daniel Craig being all sullen. What successful movies are they trying to remind us of? Casino Royale, the Bourne films. "Hey, (s)he's in this?" Ralph Fiennes, because there aren't any more Harry Potter films for him to do. Line of dialogue that's really what the whole movie is about: "Some men are coming to kill us. We're going to kill them first." Spoilage? Mild. James Bond is being interviewed by a psychiatrist while M (Judi Dench) is looking on. He doesn't like being asked about "Skyfall." What is "Skyfall"? Apparently, it's the reason why Bond is so glum in this movie. Bond is always so glum these days. Enticement Percentage Increase: 75 percent. As great as Casino Royale was, that's how disappointing Quantum of Solace was. So this teaser's main purpose is to assure us, "Don't worry, Skyfall is gonna be totally rad." They do this the same way that all trailers do it, which is feature a lot of quick cuts of awesome action snippets—Explosions! People falling! Caskets!—sprinkled with short percussive blasts of Inception-like music. 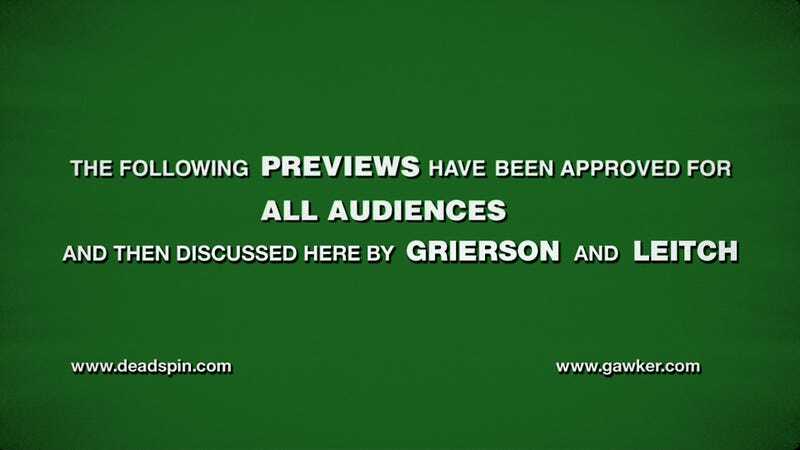 So, yeah, maybe this teaser is a little generic, but what it sells, it sells hard. And admit it: You still love Casino Royale and want this one to be as good. Trailer category: Give the People What They Want, Comedy Edition. Major selling points: It's those guys who were funny in the first film. What successful movies are they trying to remind us of? Uh, Anchorman. "Hey, (s)he's in this?" Right now, all we know for sure is that the core KVWN news team—Will Ferrell, Steve Carell, Paul Rudd, and David Koechner—are all back. That will be enough for anyone who's excited about this sequel. Line of dialogue that's really what the whole movie is about: "Look, it's gonna be a fun movie." Spoilage? Nonexistent. Is it possible Carell's Brick Tamland is even stupider than he used to be? Also, is this movie going to be called Anchorman 2 or Anchorman: The Legend Continues? Suspense! Major selling points: Lots of big stars in period clothes acting rich and sad. "Hey, (s)he's in this?" Joel Edgerton, Isla Fisher. Line of dialogue that's really what the whole movie is about: Daisy (Carey Mulligan) says to Gatsby (Leonardo DiCaprio), "You always look so cool—the man in the cool, beautiful suit." But, of course, it's said in a way that's meant to seem melancholy. Oh, poor beautiful Leo. Spoilage? Mild-to-Medium. If you're familiar with the F. Scott Fitzgerald novel, you'll recognize the characters and the setting. And if you're familiar with how Luhrmann takes revered works of art— Shakespeare's Romeo and Juliet, Nirvana's "Smells Like Teen Spirit" in Moulin Rouge—and gleefully turns them into gaudy, over-the-top ocular assaults, you'll see that he's doing the exact same thing here with the Great American Novel. And whaddya goin' do about it? Nothing, that's what—other than not see the movie, of course. Enticement Percentage Increase: 67 percent. Look, I understand why people get so bent out of shape about the idea of Luhrmann taking on Fitzgerald. Nonetheless, this trailer very much seems to be a way to egg on his detractors: "You think we're gonna desecrate The Great Gatsby, huh? Wait till you see just how much we desecrated it!" The trailer plays like an extended middle finger to anyone willing to be shocked by how irreverent Luhrmann likes to be with his movies. The utter audacity of the whole endeavor at least makes it intriguing. This movie could end up being utter crap, or it might be brilliant. Luhrmann has made both types of movies in his career. Major selling points: Joaquin Phoenix, acting strange. Also, this is the new movie from Paul Thomas Anderson. What successful movies are they trying to remind us of? They're not that concerned with reminding you of any other movies. Which is sort of the point—they want The Master to feel like it came straight from a one-of-a-kind visionary. "Hey, (s)he's in this?" Joaquin Phoenix. That's all this teaser will tell us. Line of dialogue that's really what the whole movie is about: "What happened?" "Let's just see if we can't help you remember what happened." Cryptic. Enticement Percentage Increase: 81 percent. I was excited enough already about seeing The Master, so I don't need a teaser to stoke my interest. Still, this is almost cruelly opaque in how little it reveals about the overall film. But that's fine: I'd rather know as little as possible. Also, is it October yet? Major selling points: Bill Murray as President Franklin D. Roosevelt. An air of utter genteel inoffensiveness. What successful movies are they trying to remind us of? The King's Speech. My Week With Marilyn. The Iron Lady. Really, any film that exudes "prestige" or one that your mom will say "looks like a nice movie." "Hey, (s)he's in this?" Laura Linney, Olivia Williams. Honestly, considering how long Hyde Park on Hudson has just been known as "that movie where Murray plays FDR," it's sorta shocking that any other actors are also in it. Spoilage? Medium-to-High. This is one of those trailers where there's a lot of plot busyness so that we understand what's even going on. (See how much easier it is to make a Batman movie?) But Hyde Park on Hudson is "based on true events" as FDR and his distant cousin (Linney), who are having an affair, must entertain the King and Queen of England during the summer of 1939, right before the start of World War II. So, this movie has politics, intrigue, romance, and the sort of cheeky humor that's supposed to make you titter with amusement. Enticement Percentage Increase: 22 percent. Boy, this sure feels like one of those star vehicles designed expressly to win an actor an Academy Award. In this case, that's Murray, and while he seems like a pretty credible FDR, Hyde Park on Hudson seems droopy and dull, a "quality" motion picture that might make you drowsy. Can we just give Murray a retroactive Oscar for Lost in Translation and be done with it?